On which side are we standing; War or Peace? This is the question I am asking from myself each time a threatening news is released about Iran in media. This is my answer so far: War is the time for generals who are bragging for each other, Peace is the time for women who are bargaining for their absolute rights. In the previous posts I pointed out Environmental consequences of War and now I am going to reflect the opinion of women who are strongly against another war . “As a feminist and women’s rights activist, or someone who is concerned about gender equality issues, how do you feel about the increased militarization of the region and the possibility of war looming?” This is the question that this campaign is trying to answer. 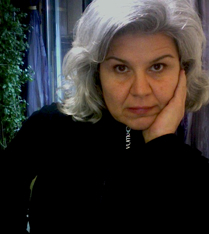 Gita Hashemi, Iranian-Canadian artist with a wide range of creative, critical, pedagogic and technical art skills and experience, in supporting the campaign against the sanction, war and militarization in the Middle East, says:” Militarism is the direct product of patriarchal system. In war and military violence, regardless of what side becomes the winner, the losers are always women”. She mentions that “next year will mark the tenth anniversary of U.S. and NATO’s second-round war and military intervention”. “The United States, that is the main player and leader of militarist intervention in the Middle East, the economic, political and social conditions for women have suffered immense setbacks because successive governments have cut back social benefits and support systems while investing in war and militarization, and their domestic policies similar to their foreign policy has shifted to the right and, consequently, become more misogynist.” Gita Hashemi states. Sanctions against Iran, to prevent Iranian government follow its nuclear program is now stepping in new stages. The United States has gradually tightened sanctions because of what US claims “Iran’s failure to answer questions about its nuclear program, which Washington and its allies suspect is a cover to develop nuclear weapons”. While a new U.S. law is aiming financial institutions that deal with the Iranian central bank has garnered much attention, sanctions blacklisting of Iranian banks had a more immediate, sharp effect on humanitarian trade. Over the last five years, the blacklisted Iranian-linked entities, gradually is squeezing Iran’s ability to do business with the world, this has resulted in facing difficulties providing raw materials for the factories which eventually is affecting normal Iranian citizens in their everyday life. Difficulties for importing many types of medicine and even diapers etc., is challenging the human side of sanctions against Iran. Sanctions in one hand and threaten of war on the other hand, is putting Iran’s women movement under pressure which inhibits or slowdowns the women equality and warns against the consequences of war for the country’s democratic movements.